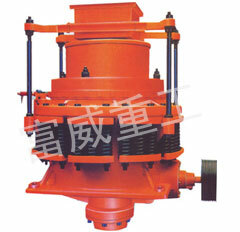 The Uses Of Cone Crusher? Application field and scope? This crusher is widely used in mining industry, metallurgy industry, construction industry, road building industry, chemical industry and silicate industry. It suits for crushing hard and medium hard ore and rock such as iron ore,limestone, copper ore,quartz, granite, sandstone etc. Cone crusher work, the motor rotates through the pulley or coupling, cone crusher and cone crusher shaft cone Department of force in the eccentric action of sets of fixed points around a week before campaign spin. So that the cone crusher broken near the wall from time to time and from time to time to leave the solid-mounted on the adjustment of rolling onto ace tabular wall surface, so that ore in the crusher cavity constantly under attack, the role of squeezing and bending the realization of the broken ore. Motor-driven through the bevel gear sets eccentric rotation, so that broken cone pendulum movement for rotation. Cone sometimes broken and sometimes left near the fixed cone, the completion of broken and nesting. Support sets of junction with the frame body pressed by spring, when the broken piece of metal falling into the hands of machines, such as when objects can not be broken, have a compression spring that is deformed from foreign bodies, the realization of insurance, to prevent machine damage.